30th January 2019 | filed under Aesthetic Treatments, Face, Lips, Non Surgical, Non-Surgical, Skin. Have you ever wished you could wake up with perfect makeup, ready to face the day, without worrying about your appearance? To feel confident that you have the perfect lips or that your eye-liner is flawless without even looking in the mirror – the stuff of dreams. 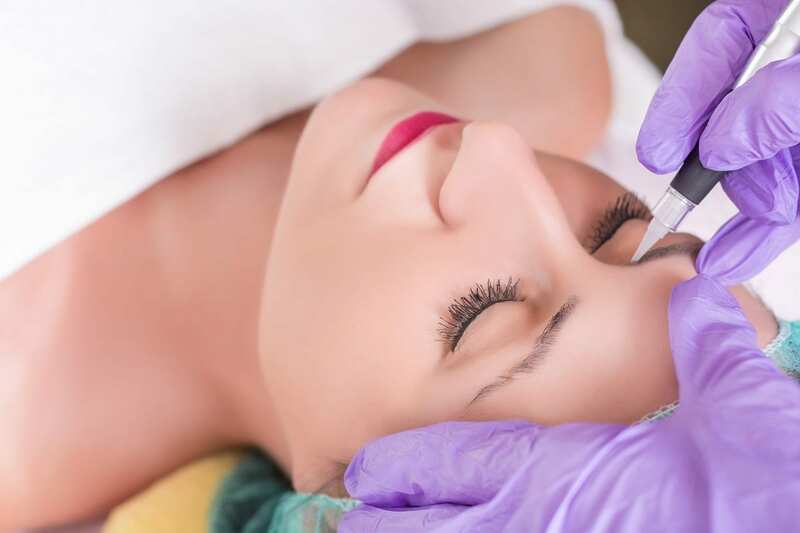 Of course, we all know about permanent makeup and the stars who’ve benefitted from it, but those procedures are often so expensive, not to mention…so permanent. However, the dream of having that perfectly accentuated, ready-to-wear face may not be as far as you think. In this article, we’ll look at the different types of semi-permanent makeup techniques that are now available as well as the celebrities who swear by them. Cosmetic tattoos have come back, new and improved, and are more popular than ever before – just look around. More and more of the famous faces staring back at you from your TV or the pages of fashion magazines are sporting this latest trend. Where airbrushing used to be relied on to give stars that refined, picture-perfect close-up, an increasing number of celebrities are relying on semi-permanent makeup procedures to take their beauty to the next level. Micropigmentation is an advanced form of semi-permanent, cosmetic tattooing procedure, which provides long-lasting enhancement of prominent facial features, such as brows, lips and lashes. The procedure uses a hand-held devise with various different settings and needle options to create a bespoke treatment, depending on the patient’s skin type and desired result. It is also much kinder on the skin and gives longer lasting results than previous cosmetic tattooing procedures. Micropigmentation techniques have been refined in recent years, and a wider selection of pigment colours have been developed so that technicians can create ultra-natural looks. Where traditional tattoo ink has more of a watery consistency, the pigments used for micropigmentation are thicker, allowing for a more natural finish. Micropigmentation is far superior to micro-blading in many respects. First and foremost, the procedures are completely safe; as the technique requires a high degree of skill, it’s only carried out by highly trained and qualified technicians in a clinically sterile environment. Unlike the blocky and unrefined cosmetic tattoos of the past, micropigmentation is very natural-looking. Semi-permanent eyebrows often can’t be distinguished from the real thing. And although results are long-lasting, they’re not permanent and will gradually break down and fade over time. Although the longevity of the results will depend on your age and skin type, the pigment will stay in your skin for a number of years before naturally fading away. Without the worry of fading, smudging or touch-ups, semi-permanent makeup is perfect for busy, active, and sporty women alike. No makeup, no hassle, no worry. No wonder so many celebs are crazy about this new technique. Stars like Angelina Jolie, Gwen Stefani, Rihanna and Bella Thorne are just some of the celebrities who have opted for semi-permanent makeup procedures. Here are some of the most common micropigmentation procedures that have recently been trending among the stars. By far the most prominent micropigmentation procedure, semi-permanent eyebrows are everywhere. In fact, as the first and most popular of these techniques, they have become virtually synonymous with micropigmentation. Semi-permanent eyebrows have enjoyed a great degree of popularity among celebrities over the past couple of years. Stars such as Megan Fox, Bella Thorne and Louise Thompson have improved their brows with this new procedure. Semi-permanent eyeliner has been very popular in the past year. This procedure offers perfect enhancement and definition to your eyes at any time of day or night. And best of all, you neither have to worry about washing it off at night or putting it on again the next morning, saving you loads of time and hassle. It can be applied to both the top and bottom lids. In addition to eyeliner, the latest trend among celebs is to have tiny micro-droplets of pigment nestled in between each lash to give the appearance of thicker, fluttery lashes. These semi-permanent lashes create natural but unmistakable definition to the eyes. With these procedures, you may never need to use gloopy mascara or eyeliner ever again. Victoria Beckham is one of the most well-known stars to have had semi-permanent eyeliner. 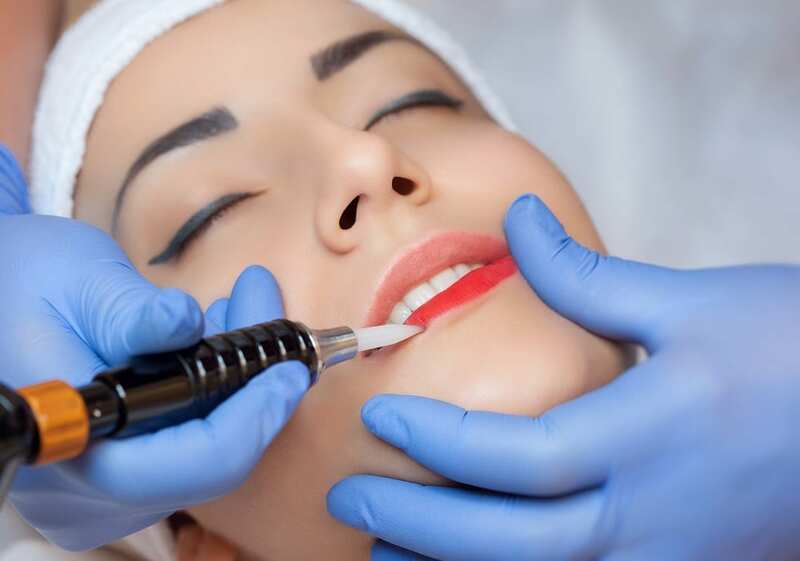 Rather than creating volume or puffiness, this micropigmentation procedure is designed to define lips; it gives the appearance of fuller lips without relying on injections. There are two basic options: lip blush or full lip tint. To create lip blushing, the border of the lip is first outlined, and this outline colour is then shaded down into the middle of the lip in a circular motion to give it more of a blended look. The interior part of the lip is often left without colour for a more natural appearance. In contrast, a full lip tint will give the lips the appearance of a full coverage lip stick or gloss. Opting for a more natural pigment colour often requires more frequent touch-ups; therefore, if you’re considering this procedure, it’s not a bad idea to opt for a pigment that’s one or two shades darker or brighter, depending on your natural skin tone. Pamela Anderson is perhaps the best know celebrity to have undergone semi-permanent lip treatment. Thanks largely to the likes of Megan Markle and Emma Stone, both of whose freckles happen to be the real deal, semi-permanent sun spots have become increasingly on trend recently. There are numerous bloggers and YouTube personalities who’ve tried on this look. Micropigmentation doesn’t show any signs of slowing in 2019; in fact, as the technology becomes increasingly refined and more accessible – in terms of both cost and prevalence – we predict that it will only increase in popularity. Who knows? It could become as commonplace as getting a facial or massage, perhaps even replacing regular makeup altogether. You can rely on the dedicated team at Aesthetic Skin Clinic to keep up-to-date on the latest micropigmentation trends and technology. If you’re interested in learning more about our procedures for semi-permanent makeup in Guernsey or semi-permanent makeup in Jersey, get in touch with us today.